I have different size beams I need to connect on the center of a post. How do I ensure my beams stay the same height? The reasoning for the different size beams is because of the grade of my yard and height of my deck next to my pool. 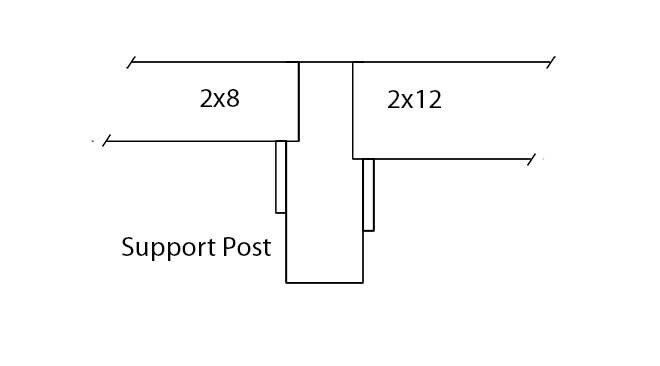 I need to have the 2-2x8 with the 2-2x12 on the same 6x6 post. How do I connect them? See attached pic. 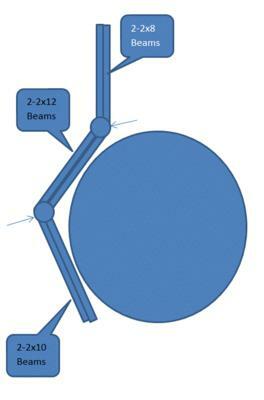 It's not entirely clear why you need varying sizes of beams (2x8, 2x10 and 2x12s) because increasing the beam size is typically intended to permit longer beam spans from support post to support post. But if you are set on this approach, you will have to use some carpentry techniques to allow for a 2x8 and a 2x12 beam to attach to to the same post. There are different ways to do this. I will try to explain a method that does not rely on specialized metal connector and hardware. You could cut notches going down opposite sides from the top of the post. Inset the notches at least 1-1/2" and extend the notch to the correct depth of each opposing beam. One notch going down 7-1/2" and the other going down 11-1/2" as the case may be. The tops of each beam will be flush with the top of the post. The beam will rest directly on the post for a straight down transfer of load. You ought to scab a 2x6 vertically along the post wall under each beam so the 2x6 actually takes some of the load from the beam. You can fasten the 2x6 to the post using carriage bolts. They go all they way through the post and are the most heavy duty of solutions. You will also have to screws the ends of each beam to the central vertical portion of the support post. Truss screws by Fastenmaster or GRK would do a great job. This is one technique that would surely perform well for you.